Home Marketing 5 Lessons From the Best Example of Content Marketing Ever? 5 Lessons From the Best Example of Content Marketing Ever? Calling all content marketers! We would LOVE your ideas and insights on this new content production survey from our friends at Rundown. It should only take a few minutes, and you’ll get a copy of the report when it’s been analyzed in August. Thank you for your time and brilliance! Your industry doesn’t matter. What matters is that big companies are embracing big content, and in so doing they are changing the expectations of YOUR customers, whether you like it or not. It doesn’t matter whether anyone in your industry is doing real-time Twitter response. Major companies are doing it, and thus are training consumers to think of Twitter like a telephone. It doesn’t matter whether anyone in your industry is answering every customer question publicly. Major companies are doing it, and thus are training consumers that the era of self-serve information is truly upon us. It has always been this way. In 1998 when I was a Web strategist, I remember vividly when Amazon.com first rolled out tabbed navigation. This kicked off an entire era of tabbed navigation for sites of every size and category. It didn’t matter whether a competitor in YOUR industry had tabbed navigation, it mattered that a site as prominent as Amazon did, and thus set new expectations. Going even further back, in 1994 I was working at my first Internet company (Internet Direct, where we invented virtual Web hosting). On October 27 of that year, Wired (then hotwired.com) launched the very first banner ads. Those banners were 468×60 pixels because that was the size the hotwired designer shoehorned onto the home page. And guess what? That became the standard size for the entire World Wide Web, codified by the Internet Advertising Bureau in 1996. 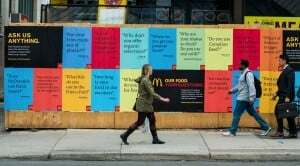 That’s why I’m so enamored with the McDonald’s Canada “Our Food, Your Questions” program. It doesn’t matter that you’re probably not working for a fast food company, the Golden Arches’ embrace of information could be the start of a cultural change that impacts every business. That’s why it’s a core case study in my forthcoming new book Youtility: Why Smart Companies Sell More by Selling Less. I interviewed Joel Yashinsky, CMO of McDonald’s Canada to get the inside scoop. The book won’t be out until next year, however (stay informed at jaybaerbook.com). So, I’m spilling the beans on the McDonald’s example here on Convince & Convert. 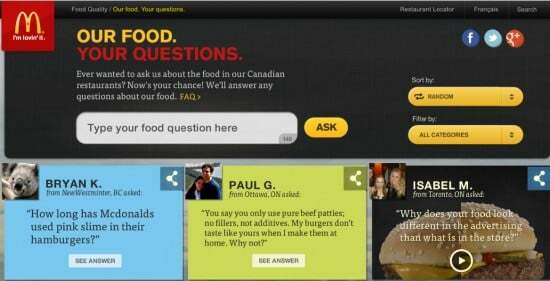 Launched in June, the Our Food, Your Questions program invites any Canadian to ask any question whatsoever about McDonald’s food on a special website developed by Tribal DDB Toronto. To ask a question, participants must connect with either Twitter or Facebook, providing social visibility and a ripple in the pond viral effect. So far, more than 16,000 questions have been asked (they are getting 350 to 450 per day), and nearly 10,000 have been answered. You’ve heard of Gladwell’s 10,000 hours? How about McDonalds’ 10,000 questions! The program scope is only around McDonald’s food, so questions about non-food topics are directed to other resources, and some questions are of course duplicates. But there’s no dodging the tough questions, and that’s the amazing thing about this program. There are so many smart elements to this program, that you literally could write a book just on this case study. Here are the top lessons. Google’s Zero Moment of Truth research (also a big part of my new book) finds that consumers need twice as many sources of information before making a decision today than they did just one year ago. McDonald’s Canada understands that there is a huge amount of chatter about their food (and more every day due to proliferation of social). They can’t respond to it all individually, so instead they’ve built a one-stop information shop. Could McDonald’s Canada have created a big effort around emailing questions, or building a new food-oriented call center, like the Butterball Turkey Talk-Line? Sure, but those options don’t have the benefit of answering questions publicly. I especially like that they provided an option to “follow” a question, and be notified when it has been answered. More than 3.1 million questions have been read, versus 16,000 asked. 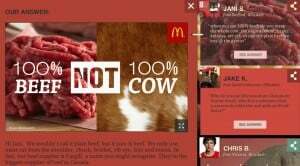 Before the program commenced, McDonald’s Canada conducted a thorough chatter analysis to determine what types of questions were already being asked online about their food. This helped identify the types and categories of questions that were likely to be asked on the site, once unveiled, and enabled McDonalds’s to get the gist of about 600 answers ready in advance. It’s not only the incredible amount of staff time now being devoted to question answering, but McDonald’s is also putting forth substantial dollars to promote this program offline. An innovative and interesting mass media campaign that includes TV, radio, print, and a variety of outdoor executions is in full swing, and is driving awareness of the website and its contents. This is a very important trend that I’m seeing more and more – companies promoting information instead of the company itself. Being great at transparency and information isn’t (and cannot) be one person’s job. It must be part of many people’s responsibility, because everyone in your company has information and knowledge that your customers will value. At McDonald’s Canada, they’ve enlisted help from their entire supply chain to help answer questions, not to mention the dozens of employees and agency participants. I think everybody’s going to start. We knew that there was really no option if we were going to become a brand of the 21st century, as we were of the 20th century. The customer today wants to know more, especially about the food that they’re eating. with the customer. You can’t just preach to the consumer these things that you know are true. You have to engage them, so that they can come to learn it and believe it and build that trust with you.